Sinchon area has it all, but clearly lacks some consistency. As local authorities unveil a new KRW 7.5 bn plan to redesign it, it seems high time to get the big picture and to make sure they'll get it right. - Korea's biggest education hub, with Yonsei University (N), Hongik University (W), Ewha University (NE), and Seogang University (S) within a very short radius, and Myeongji University (NW) not much further afield. If Edae and Hongdae areas have stronger personnalities because they are more clearly defined around one "major" (Ehwa being a women's university and Hongik specialized in creative studies), Sinchon is a more central and neutral "battlefield", and less dominated by Yonsei.
. Sinchon-ro : Eastwards towards Seodaemun and downtown, and Westwards towards Seogang Bridge / Yeouido or Sangam / DMC. - Sinchon Rotary is as lamely designed for humans as it is for vehicles, and the dialogue between its Northern and Southern halves more than poor. Unsurprisingly, they belong to different districts (respectively Seodaemun-gu and Mapo-gu). It's not a total train wreck, but you can feel the wasted space and unoptimized urbanism. - Yonsei-ro is often saturated : the only passage under the railway, in front of Yonsei's main gate, creates a massive bottleneck, particularly since on the other side, the gigantic mass of the university and Ansan offers no alternative to Seongsandae-ro, a major West-East axis supporting the bulk of Seoul's boom in its Northwestern quarter. 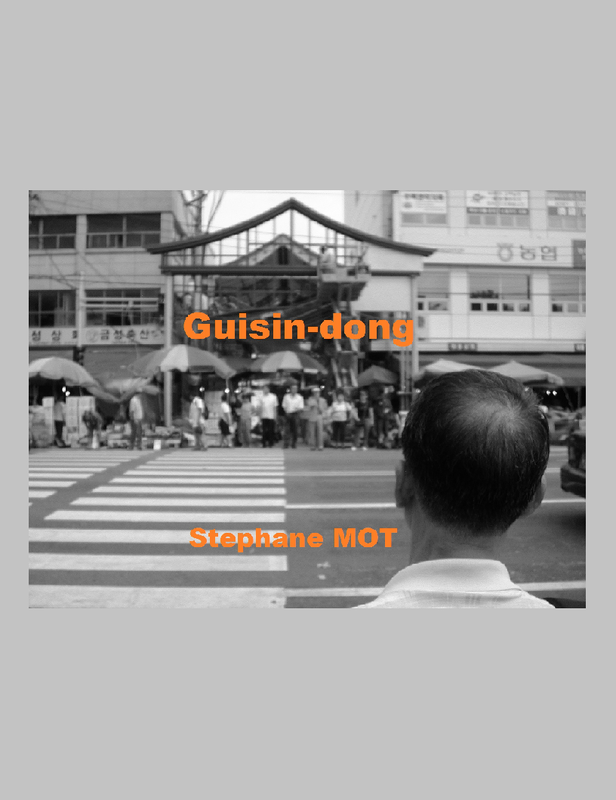 - Sinchon lies at the center of the Light Railway Transit system that will connect, by 2017-2018, Unpyeong-gu with Seodaemun-gu, Mapo-gu, and Yeongdeungpo-gu (see "Subway news : Sillim line, Line 3..."). I presume local authorities will merge this third Sinchon Station with the two existing ones - if not, something is rotten in the state of Seoul ! - Speaking of a education, commerce and culture hub is one thing, succeeding another one. You don't stimulate culture by decree, and Sinchon needs more than a new landmark or some cosmetic changes on one existing street. Solutions should fluidify the whole neighborhood. Local services and commerces also need a boost : even with the Hyundai Department Store / Uplex and Sinchon Migliore / Sinchon Station complex, the area doesn't really reaches its full potential. It even lags behind Hongdae in the eateries' department. 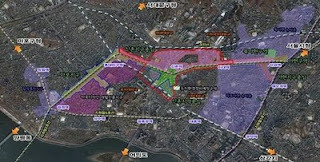 - This new masterplan also falls short of tackling the Yonsei-ro bottleneck issue. 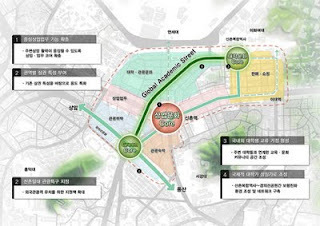 Ideally, the Gyeonghui Line should be buried and covered with a park, just like the nearby Yongsan Line (at Yeonnam-dong).